William of Occam was a medieval philosopher and theologian. Just like his contemporary, Roger Bacon, he placed considerable emphasis on the study of nature through empirical methods. That’s why he was condemned as a heretic. Roger Bacon (not to be confused with Francis Bacon) had similar problems with the Church. We know Occam because of the principle of parsimony in philosophical and scientific thought, aka Occam’s Razor: “When trying to explain something, it is vain to do with more what can be done with less.” No wonder he got denounced by the pope for “dangerous teachings”! Why involve Occam here? Well… While physicists usually don’t like philosophers, some philosophy of science is not a bad thing, so I created this page for that: philosophical reflections. Let me offer my first one: Occam would have loved the math behind QM. Indeed, looking back at the math and physics I just went through, I am deeply impressed by the beauty of the argument: the physics call for the math, and the math becomes the physics. We observe interference – not only of light but also of matter particles, notably electrons – and math gives us the tools we need to model that. In fact, math becomes the language in which we express the phenomenon. Now, math surely is a language that respect Occam’s Razor: not one ‘word’ is wasted, and there’s extreme parsimony in the concepts used. Complex numbers are the key to understanding. In ordinary language, complex just means “consisting of many different and connected parts”, and oft-used synonyms are compound, composite, or multiplex. Complicated is not a synonym of complex: complex numbers are not complicated: it’s a shame our educational systems do not expose us to them at an earlier age, if at all. Natural numbers count things: the legs of an insect, or the number of hairs on our head. The operations of addition, subtraction, multiplication and division come with the concept of counting. Division gives us fractional numbers (i.e. rational numbers). Of course, positive numbers call for negative numbers, as we want to measure a difference. Positive numbers are associated with one direction of the x-axis and, therefore, we associate negative numbers with the opposite direction. Thinking about opposite directions calls for intermediate directions, or – what amounts to the same – we could say that one dimension (the real axis x) calls for another (the imaginary axis y). And so there we are: we have pairs of numbers, aka as vectors or complex numbers indeed – or, as Feynman calls them, arrows: things with a magnitude and a direction. Directions are defined by angles. If we change the direction of straight lines, they get curvature. We can define a circle as a ‘line’ (I should say a curve, of course) with a constant non-zero curvature. 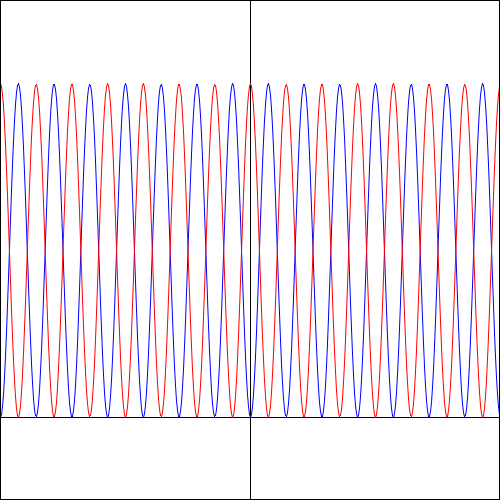 Waves are periodic functions. Waves interfere. Waves explain interference effects. It’s beautiful. One thing calls for another. That’s the way dialectical thought works: thesis, antithesis, synthesis. But back to physics. Look at the symmetry of the two possible ways, (a) and (b), in which two identical particles interact. The functional form modeling both situations is, and obviously should be, the same function: f. It is only the argument that differs: in situation (a), the argument is θ, while in situation (b), it’s π–θ. That’s pure logic based on the symmetry involved: (b) is the same situation as (a), but we exchange the role of the detectors (or, which amounts to the same, the role of the particles). Detector 1 becomes detector 2, and vice versa. Or particle a becomes particle b, and vice versa. 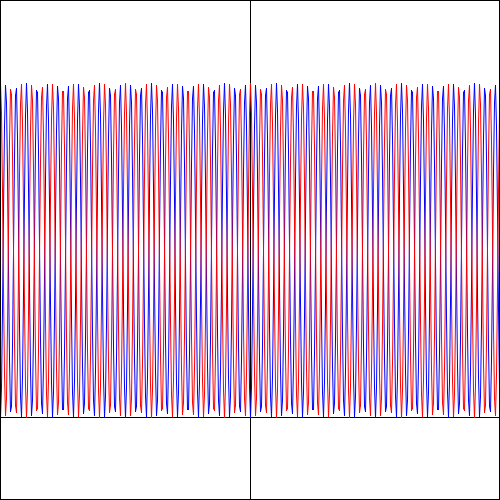 The interference pattern which one will observe – so this is a reference to reality 🙂 – will be something like either the blue or the red graph below (the only difference between the four situations below is the frequency of the wave function). If the particles are bosons, we get the blue probability function: we only add the real parts of the (complex-valued) wave functions f(θ) and f(π–θ) before taking the absolute square. The imaginary parts cancel out. Conversely, if the particles are fermions, we get the red probability function: in that case, the real parts cancel out, and so we only add the imaginary parts of f(θ) and f(π–θ), before taking the absolute square to calculate the combined probability function P(θ). If the frequency of the wave function becomes a large number, then the interference pattern will be hard to detect, as shown in the last of the four diagrams. In that case, we have a classical interaction, like between two billiard balls. Now, it is, in fact, likely that the frequency is a (very) large number, because the 1/ħ factor in the de Broglie relation ω = E/ħ equals 15×1014 if E is expressed in electronvolts. Hence, the angular frequency of a 1 eV photon is 15×1014 radians per second, which corresponds to a light frequency of 2π×15×1014 ≈ 100×1014 Hz. That’s light with fairly low energy: infrared light, or thermal radiation. In other words, this frequency is not very high. Indeed, matter particles (e.g. electrons) will have frequencies that are much higher, because, unlike photons, they have mass and, hence, a lot more energy (that’s just the E = mc2 equivalence relation). That’s why interference between electrons was only observed (and predicted) in the 1920s (Davisson-Germer experiment), i.e. very recently on the timeline of human evolution. 🙂 These high frequencies also explain why we don’t see interference in the day-to-day world that we humans inhabit. What is that I want to say? Nothing. As mentioned above, I just wanted to note the parsimony in the quantum-mechanical explanation of reality and, hence, the beauty of the theory: all is needed, nothing is superfluous, and, therefore, it’s perfect logic. I think that’s great. Let me make another point that’s interesting from a philosophical point of view: it’s about all of the symmetries involved in physics. In any case, if two-dimensional numbers (complex numbers) are ideally suited to describe what’s usually referred to as quantum electrodynamics (QED) – so that’s interactions involving photons and electrons – what about quantum chromodynamics (QCD) – so that’s interactions involving the strong force (quarks and gluons), instead of the electromagnetic force? Instead of just one boson, we’ve got three in QCD, referred to as gluons, with a specific ‘color’. To be precise, we actually have 8 independent types of gluons: one of three ‘colors’ (r, g and b) can mix with one of three ‘anti-colors’. While that makes for 9 types, theoretically, only 8 of them are linearly independent. In addition, we know that we have quarks that come in various flavors (usually u or d, but we also have s, c, b and t) and combine in basically two ways: protons and neutrons (baryons) consist of three quarks, while mesons consist of two quarks only, and we should note that mesons behave like bosons too. So, yes, we have a lot of symmetries here too, and there is a special type of four-dimensional numbers – quaternions, which we can look at as pairs of complex numbers – that simplify the analysis. However, it’s obvious that QCD is infinitely more complex than QED and, hence, I’d need to have a look at it myself before I write anything more about it. A number of remarks can be made here. f(x, t) = f(x – ct). Hence, we can ‘freeze’ a wave in time or, alternatively, in space, and we won’t be able to tell in what direction the wave is traveling. The math of the function basically treats both variables the same and shows that, to some extent, time and space are indeed interchangeable as dimensions, although I should add that it’s only special relativity theory that shows how intimately they are related (see my post(s) on special relativity theory). We change the arrow of time (i.e. we put a minus sign in front of the time variable). In my posts on this topic, I noted that the weak force is the weird force because, unlike the other forces, it does not respect any of the individual symmetries, nor does it respect the combined CPT symmetry. Hence, the arrow of time is not only something that comes out of the so-called ‘Entropy Law‘ (i.e. the 2nd law of thermodynamics), with which you’re surely familiar. No. There’s also something else there, buried deeply in what is often referred to as Quantum Flavordynamics (QFD), but what’s better known as the theory of the weak interaction. Both go a step beyond what I wrote on this page here. Thanks again and keep it up !